I’ve been wanting to put up Christmas lights outside since Thanksgiving weekend but life’s been hectic. We picked up this moose (or reindeer?) a couple weeks back and it’s been standing there on our front porch all by its lonesome. (But cute right??? We got it from Target). This past weekend as we were coming home in the evening, I couldn’t help admiring all the beautiful Christmas lights in our neighborhood and wished we’ll get some lights up soon too. 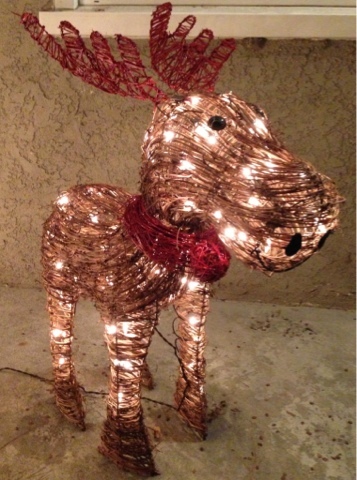 As I stepped out with Sugar for our #mileaday run, KT sprung into action and put up our Christmas lights with reindeer and all! 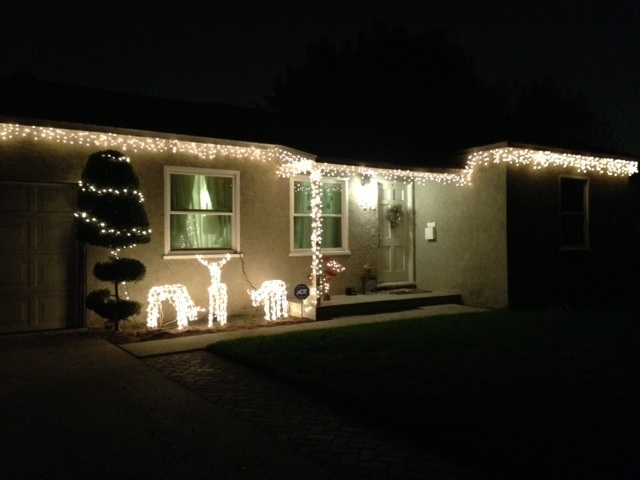 We actually didn’t have enough of the icicle lights to go across the wall on the right with the single window. I thought we can easily pick it up the next day from just about any store. First we went to Lowes since we had a couple items to return there. Not a single box of icicle lights. So we thought we’ll find something at Walmart. Again, not a single box of icicle lights. There were plenty of the net lights and single row lights. KT started wondering if maybe icicle lights are out of style and have been discontinued. I wasn’t ready to believe that. So I thought they GOTTA have it at Target. When Target didn’t have a single box of icicle lights too, I decided I better ask an employee. Turns out these lights are so popular that they have been out of stock for weeks. Thank goodness! Better to be out of stock because they’re popular than to be discontinued. That means we still might be able to find it at another store. We stopped at another nearby Walmart – no luck. Then Home Depot – they had hardly ANY lights left. Big Lots- that’s a no too. Dollar Tree next door – we wished. That’s seven stores in two hours. I was exhausted. We remembered seeing a Family Dollar store on the way to Big Lots so we thought we’ll give it a try. HOLY COW!!!! They had a whole shelf of them!!!!!!! WHOOHOO. High-Five. I thought this deserved a second high five so I gave KT another high five. =)))) We were worried that the color of the lights won’t match but as it turned out, they all matched perfectly. (We bought a couple extra boxes in case a string of lights burns out and we can’t find any replacements). So PRETTY!! I LOVE the holidays!